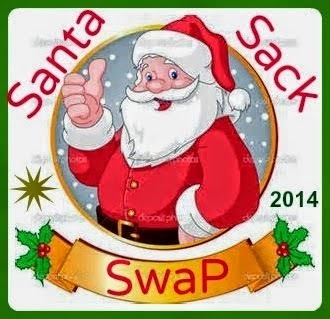 Earlier this year I signed up to the Santa Sack Swap again run by the lovely Cheryll. My partner in crime this time was Barb. Boy did the lovely Barb spoil me!! I opened one present over breakfast before we went to church. It was a 7.30am service, so there was no time to do any more. Would you believe I picked the Santa Sack out to open! It is so sweet. When we got home from church, I took the rest of the presents out onto the balcony to open in peace over a cup of tea. A little wall hanging; a beautiful French Vanilla candle; a little bon bon holder filled with Minties and Sherbets; a lovely embroidered candle mat (probably would rather use that as a mini table topper - would hate to drip candle wax on it!! ); and a little Christmas pin cushion. All of these things have lovely embroidery on them. Next was this lovely table runner, with some pretty tea cups embroidered on it. Fits my coffee table perfectly. And last, but not at all least is this gorgeous journal and cover. Just look at that lovely embroidery! Back very early in the swap, my blog friend Shez asked who I was partnered with, and when I told her, she said that Barb did the most beautiful embroidery. She is not wrong! The stitching is perfectly even, and really well executed. Thank you Barb. You have truly spoilt me. A Christmas decoration; a biscornu; a needle holder with an embroidered cover; a peg apron (with a pack of pegs too) and a mug carry bag. 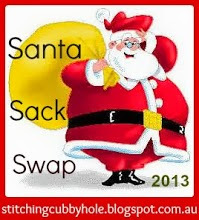 And here is the Santa Sack I made for Barb. I have heard back from Barb, and she has said she likes the things I have sent. Whew!! Although I love the idea of the swap, I always stress out about whether or not my partner will like what I make for her. Now remember last post I said I would show you my nice tidy cutting table? Well here it is. At the back are several projects which are currently on the go, nice and neat in their own project bags. We have to wait and see how long this lasts. LOL. 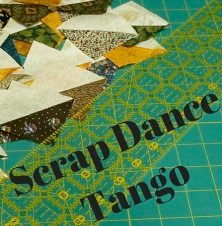 Today's project is to tidy up the work table, which is currently littered with fabrics, sewing machines, and piles of squares and strips which I have cut from scraps. Also yesterday I got the Dearly Beloved and my Son-in-Law to move an old sofa out of the room. I have switched around the remaining furniture to give me more space. Some old dining chairs are on the list to be removed as well. I am fed up with my workroom being the dumping ground for all the excess furniture in the house. A few days ago I finished up Susan's quilt. 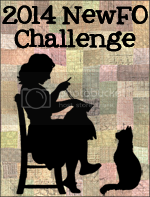 If you've been following along, you'll have read that I began this as my NewFO & Lets Book it Challenge in October. I wrote a blog post about my progress here. Life got in the way a bit but now its at the flimsy stage. I will be taking it to Stitching Hearts to be quilted after Christmas. I am really happy with the way it has turned out. The background is in two different turquoise fabrics, and I have laid them out in pinwheels. The circles are placed randomly. Also about a week ago, I got the binding on Karen's quilt finished. This was also the October NewFO and Lets Book it Challenge, so I can put a big tick on that. Done! This quilt was quilted by Robin. Last Monday, I had a text from Robin to say she had finished quilting Linda's quilt, and that I could pick it up from her sister who lives not far from me. So I dived down to Ettalong to pick it up, added the binding, then took it to Jan to sew down. Thank you Jan, you are a lifesaver. This quilt was a collaborative effort between Jan and I. Its come up OK too. With four of the five quilts completed, Jan and I set off for Wickham on Friday. Here is the boot load of donations we took. 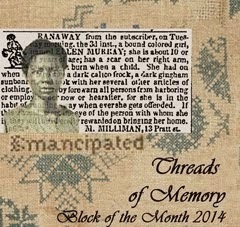 I wrote up a special post about the trip on the Stitching Hearts blog here. Do take a look at it, as there was heaps going on. I have just realised that it's almost time for my second blogaversary in about 2 weeks. Never imagined 2 years ago, that I would still be blogging 2 years later. I shall have to put my thinking cap on and plan a giveaway. Stay tuned. The other night I finished my latest Biscornu. How I love making these! And I love this one to bits. I used a free pattern from Rainburst Embroidery called Stella by Starlight. There are 2 patterns on this worksheet, and for this one I used the second of the two patterns. I showed you the other pattern on that tutorial here; it's the yellow one. The under side is a pared down version of the top. I used a DMC Rayon colour 30501 on even weave, tiny green seed beads, a few small pearls and a Swarovski crystal. All of it except the crystal was from stash. Bonus! I started with the rayon thread with some trepidation, as I have had issues with it previously, but the embroidery went very smoothly. I think probably because I only used one strand of it, so it didn't unravel as badly as it has done in the past. The biscornu shines and twinkles and glitters and I just love it! I'm itching to start another. I'm also keen to have a go at a 15 sided one, just need to find the right design. Also. I have been playing around with Instagram. If you feel like visiting me, you'll find me on @dashabrandt or #patchingpixies. Alternatively there is now a little button on the right hand panel which will take you straight there if you click on it. Say hello if you stop by so that I can come visit you. Today was my first whole day at home since 27th November. That was the day we flew to Queensland for the bridge tournament. Before you ask, we did very badly. Sigh. It was just about the first time I had sat down to the machine since then as well, although I did manage to squeeze in an hour or so on Wednesday. I put the binding onto Karen's (not her real name) quilt. If you'd like to see my previous post, you will find it here. I took it to Stitching Hearts a few weeks back, and Robin quilted it for me on her long arm. It is a full queen size, so not manageable on my DSM. I will be sewing the binding down by hand tonight, and probably many more nights as well. - and I can even off any slightly wavy edges, by using the edge of the binding as a seam guide instead of the edge of the quilt top. I then cut off the excess using the seam as a cutting guide rather than the edge of the quilt top. This gives me a nice even 1/2" excess and a nice plump binding without any gappy bits. How do you sew on binding? Do you chop the excess off first? Have you done it my way? Linking up today with Kathy for Slow Stitching Sunday.